We thought it made sense to give our customers and those looking at going offshore for Tuna and Marlin out of NJ a bit of an update, and try to put the various options for different trips into perspective. Recently, the fishing in the CANYONS has been very good, some of the best we've had in a long time. Conversely, the Bluefin action inside the canyons has been sporadic and for the most part relatively slow. The slow bluefin action is likely due to the warm water temperatures we are experiencing. It certainly seems that the majority of the Bluefin have already migrated past us and up to cooler waters, but a new batch can show up any day...you never know. Offshore in the canyons the Yellowfin Bite has been great, but the runs are lengthy and only reachable on our longer trips. 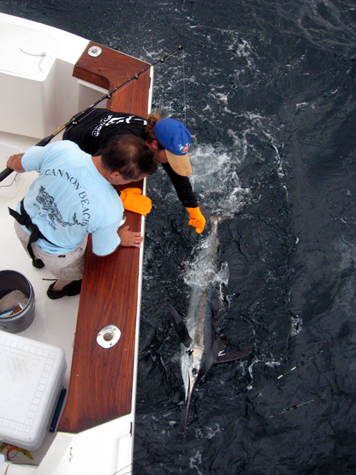 As it has for the last couple of years, there are a lot of White Marlin around as well. We have mostly been fishing 75-85 miles offshore. The Yellowfin as of today, have not moved into the 35 to 40 fathom depths, which would make them reachable on our shorter 12 Hour Tuna Trips. The only way to get to the Yellowfin right now is a longer trip, of AT LEAST 14 hours, which will give us sufficient time to get to the Canyons. Not all Canyons are the same distance and even this 14 hour trip does not allow us to get to some of the Canyons that have been holding the fish the best. Our best producing Canyon has been the Lindenkohl which is 80-85 miles each way. The closest Canyon is the Wilmington at 68 miles and we have fished there the last two days, with both good and bad results. We are hopeful that the Yellowfin will work their way inshore to the 30 to 40 fathom depths, which will put them 45 to 55 miles offshore and reachable on our 12 Hour Tuna Trips, but as of today, for the most part, they are not and our 12 hour trips will continue to target Bluefin Tuna. 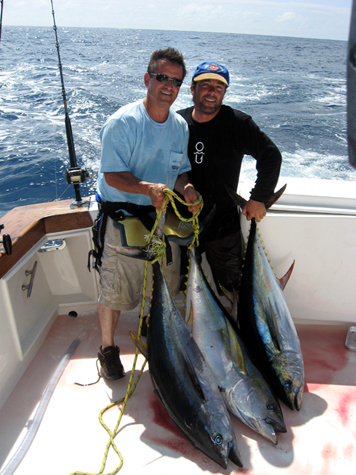 Our standard Tuna trips for 2010 are 12, 16, and 22 hours. The 12 hour trip is our normal Bluefin Tuna Trip, allowing us to go up to 55 miles and still have a good amount of fishing time. The 16 hour trip is designed to allow us to fish any of the canyons on a longer day trip, and would be the preferred "day" trip right now, based on the fishing we are experiencing. The 22 hour trip, is definitely our most productive trip, and is normally our "overnight canyon trip". We have switched our times around on these 22 hour trips, allowing us to do all of our fishing in the daytime, which is currently when the tuna are feeding. We are leaving at 1am, returning by 10 or 11 pm typically, fishing sun up until close to sun down. In years past we offered a 14 hour trip, which allows us to reach the closer canyons, and this week, we have been extending many of our scheduled 12 hour trips to 14 hours, allowing us to get to the canyon and have a shot at the Yellowfin and Marlin. As always, we will monitor the bite closely and adjust our trip types, times and recommendations, as conditions change. The longer you are out there, the more flexibility we have to manage the trip and get to where we have the best shot at loading the boat with tuna. We understand budgets and time constraints however, and will work with yours to do the best we can to maximize your chances of having the trip of a lifetime. And as a side note, there have been many of those recently!